This story is about Mike Adams of Natural News, considered the number one lunatic of the pseudoscience and anti-science pushing American Loons (a particularly vile form of worldwide loons). If you know nothing else about Natural News, Adams has claimed he’s a better scientist than Neil DeGrasse Tyson. Yes, let that sink in for a few minutes. Tyson thinks that evidence should be studied to form a conclusion, you know, the scientific method. Adams thinks that he can invent a few lame experiments to confirm his preconceived beliefs. That’s pseudoscience, in its purest form. Mike Adams’ anti-science beliefs includes just about every important scientific fact of our modern world. He is an AIDS denier (meaning he doesn’t think that AIDS is caused by HIV). He is anti-vaccination. He is an 9/11 truther. He is an Obama birther. He thinks chemtrails exist. He has advocated violence against GMO supporters. You might think there are no other lines he can cross. But you would then be underestimating his skills in lying and attacking those who support real science. Yes, you read that right. Mike Adams has started a full lunatic attack on David Gorski. If you want to read it, go ahead. It’s laughable on so many levels, and Adams makes it appear that there’s some awesome legal prosecution going on. No there isn’t. 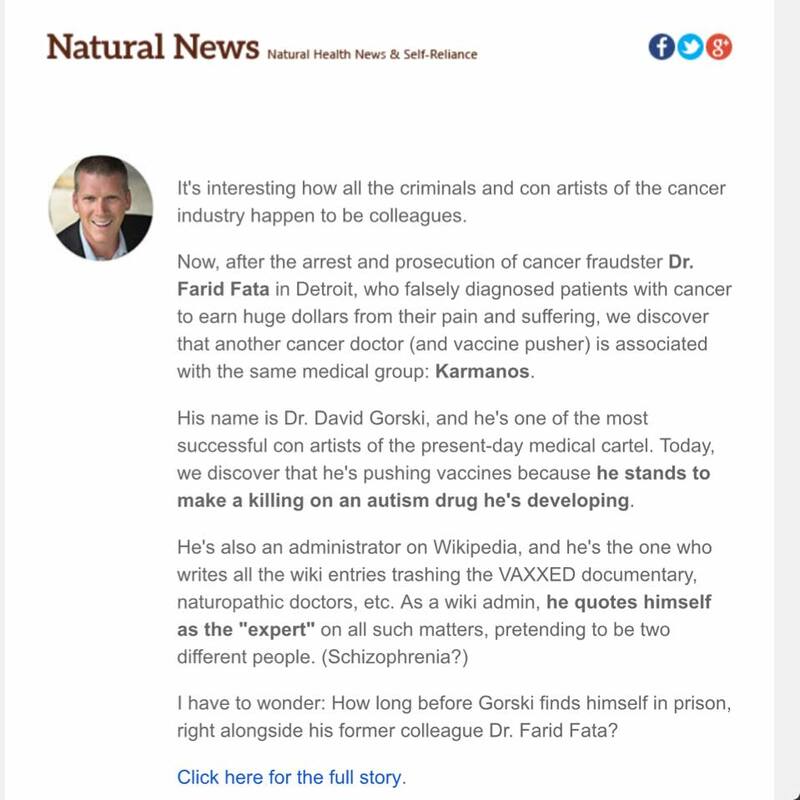 For those of you who don’t know, David Gorski is the managing editor of the website Science-Based Medicine, which is mostly an anti-alternative medicine website, the anti-Natural News. Science-Based Medicine is one of the few exceptions to the rules that websites cannot be used as reliable sources – because Dr. Gorski has the credentials of an authority in the world of science based medicine, and uses scientific facts to support his commentary. In case you were wondering, Mike Adams wouldn’t know a scientific fact if it kissed him on the lips. Therein lies the difference. There is some full-on crazy here. Although, David Gorski, a highly respected oncologist and surgeon, has his own response to the vile attacks, and he certainly does not need my support, but I cannot resist an opportunity to mock and ridicule someone as evil as Mike Adams. Yes, David Gorski is on the faculty of the Barbara Ann Karmanos Cancer Institute, one of 69 National Cancer Institute-designated comprehensive cancer treatment and research centers in the United States. Karmanos is located in Detroit, Michigan, and is affiliated with Wayne State University School of Medicine. To characterize Karmanos as a “medical group” is completely misusing that term. A “medical group” is generally a small partnership of a few physicians – on the other hand, Karmanos has 1,200 staff members, which include 300 doctors, and 100 researchers, as befits an educational and research institution of such high quality. The healthcare professionals at Karmanos treat approximately 12,000 patients each year and operates with a budget of $260 million. Clearly, unless you have the mind of Mike Adams, Karmanos is a prestigious cancer center. And that Dr. Gorski is on the faculty and staff of that center is a confirmation of his credentials and research. I won’t even bother comparing Adams to Gorski, since that’s an insult to someone like Gorski. Fata was never on the staff or faculty of Karmanos. So, the guilt by association is an asinine claim, befitting the repulsive tactics of Mike Adams. Gorski never met Fata. Ever. Even though they are both in Detroit, Fata was bottom feeding by trying to bilk Medicare out of reimbursements and focusing on quack medicine. Gorski works at a prestigious medical center. I’m pretty certain that even in a specialty like oncology not every oncologist knows every other. Fata was scum. He was prosecuted as scum. Here are the facts – Gorski has (and I think continues to) research a drug called Rilutek (riluzole) as a potential nontoxic treatment for breast cancer. This is something that anyone who has had or has family who have had breast cancer should find important. Very important to be honest. In 2010, Sanofi-Aventis, the manufacturer of riluzole, considered using the drug to treat autism. So an autism warrior, Jake Crosby, wrote an article in the website, Age of Lying about Autism, that invented some insane connect-the-dots that travelled from Sanofi-Aventis to David Gorski. Again, Dr. Gorski has refuted this insanity in detail more times than I probably know, often mocking Jake Crosby when he trolls Gorski’s Twitter feed. Gorski works with Sanofi-Aventis on a drug that may treat autism. Of course, Sanofi no longer owns the drug, and Gorski’s research has nothing to do with autism. He’s a freaking oncologist! 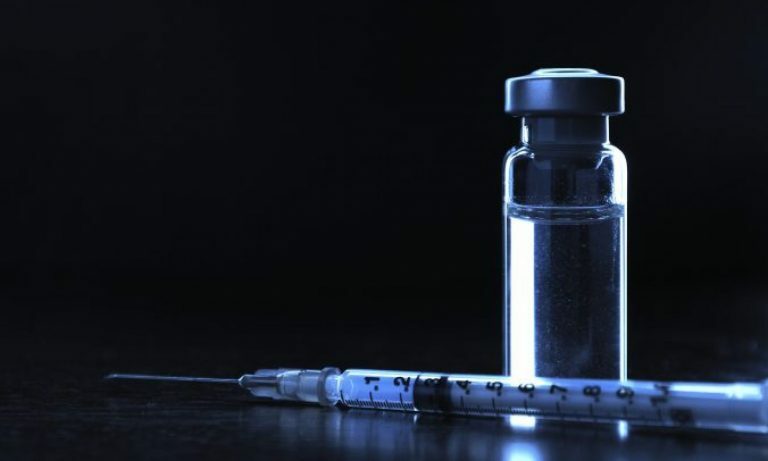 Sanofi-Aventis is one of the largest marketers of vaccines. Wayne State University receives funding from Sanofi-Aventis (though, as far as we know, none of it goes to Karmanos). Therefore, in the mind of Crosby and Adams, Gorski is being bribed by Sanofi to create an autism drug to make more money from autism causing vaccines. That’s precisely the lunatic conspiracy “connect the dots” that every lunatic conspiracy pusher uses. Take a couple of real facts, like Sanofi manufacturing vaccines, surround it by misusing the transitive relationship, and, voila, Dr. Gorski pushes vaccines to make more money for his autism drug that he invented. I’m seasick just trying to follow this. I really wish this junk film from the cunning fraud, Andrew Wakefield would just go away. But I just have a feeling it’s going to be on my blog for months to come. The lunatic Mike Adams claims that David Gorski created, edited or protected the Wikipedia entry on the fraudumentary. If you are interested, here are the list of edits, with the editor’s name, for the article. I see no editor’s by the name of Gorski. The internet has made claims that a specific editor and administrator for Wikipedia is Gorski. I have had literally 100 conversations with said editor, and many more interactions with Gorski in several locations, and I have no clue if they are one and the same person. Of course, I never asked, nor will I. Nevertheless, that editor/administrator, who is claimed to be Gorski, apparently had no fingerprints anywhere on the article. Sure, Gorski could have created a sock puppet, but that’s very dangerous on Wikipedia. One can be defrocked and banned for doing that. I’ve watched several pseudoscience pushing quacks try it, and they always get caught. But even if he did edit the article, so what? Seriously, there isn’t one review of the fraudumentary across the science universe of the internet that has one single complimentary thing to say about the film. None. I, and the purported Gorski editor, have made hundreds of edits to vaccine articles across Wikipedia. They are based on science and peer-reviewed articles, one of the basic credos of the online encyclopedia. One more thing. The Wikipedia community has accepted that blogs from well-sourced and respected writers can be used as reliable sources. Yeah, I know, blogs that push opinions are not reliable. But those who use a large amount of scientific research, and link to them, are quite acceptable. Mike Adams of Natural News is simply a charlatan and a quack. But guess what? Those who think that Natural News is a reliable source (it’s not) will push this trope far and wide. Every time someone wants to create lies about vaccines, they’ll turn to this article from Mike Adams. Every time Gorski says something positive about vaccines, they’ll use Adams’ loathsome invented conspiracies to discredit Gorski. That’s why I wrote this. Maybe if someone is searching out this nonsense, they’ll find my snarky, but reasonable, dismissal of the invented charges. Or they’ll think I’m a Gorski sock puppet.